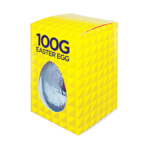 You can find hundreds of promotional sweets, mints and branded chocolates in our branded confectionery collection. 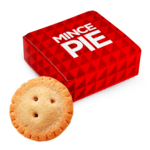 Whether you want to display your company logo on Sweets, Snacks, Mints, Lollipops, Advent Calendars, Hampers, Biscuits or want to give out boxes of chocolate for the holidays, you’ll never be short of choices. 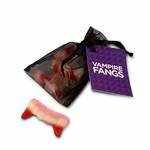 Even if you just want some branded sweets to keep on your desk for clients, you’ll find the perfect ones at Redbows. The hardest part will be deciding which sweets to choose. When you want to reward your customers, persoanlised sweets are always a great gift. 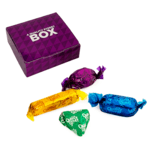 We have sweets available in a variety of packaging types including; bags, boxes, pouches, wrappers or tins. Whether you want to treat your customers to sweet bags, sugar free sweets or flow packs filled with jellies and Pastilles, there’s something to please everyone. Best of all, your logo and company information are printed on the product. These are excellent gifts to hand out during the holidays, be it Halloween trick-or-treaters, sweet heart clients on Valentine’s Day, chocoholics on Easter Sunday or loyal customers at Christmas. 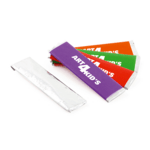 Branded confectionery always go down well at trade shows, exhibitions, conferences, product launches or site visits. 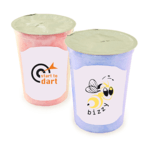 We offer an extensive range of sweets to market your brand or logo with people of all ages from different industries. For School or University events with a high footfall we recommend products that can be given out in the handfuls such as Lollipops, Sweet Packs or Double Twist Sweets. 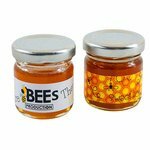 For the Hospitality sector we recommend Mini Jars of Honey and Coffee Break Boxes from the Snacks Collection. 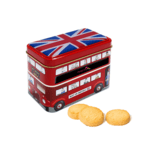 Milk Chocolate Digestives and Chocolate Chip Cookies from our branded biscuits collection are also an excellent choice. For corporate events promotional Mints are a firm favourite. People use mints to calm their nerves and freshen their breath. Try our Mint Pots or Chewing Gum Packs. For wedding favours our Retro Candy Bags and Swirly Pops are perfect, with a full colour digital label to showcase your image. For Business and Organisations looking to reward their customers, try our Corporate Branded Hampers available with bespoke options. If you would like to create a pack from the products above, please contact us. Personalised confectionery is also a great giveaway at weddings, major birthday parties and other celebrations. 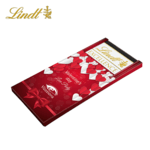 If you’re looking for a great way to promote your business, chocolate bars and boxes are an excellent suggestion. Filled with Neapolitan chocolates, chocolate pralines, or other varieties of chocolate, these boxes are printed with your company logo and business information. Available in a wide variety of sizes and styles, you can find a box to fit any occasion or budget. Whether you’re looking for a nice holiday gift or want to provide sweet treats during a large event, these chocolate boxes are a great promotional gift. Of course, if you’re looking for something fun, you can also choose chocolate bars supplied with a golden ticket or chocolate coins. Do you supply sugar free sweets and chocolates? Yes, we have recently added a range of sugar free confectionery. Check out our Sugar Free Lollipops, Sugar Free In a Flow Pack, Dextrose Lollipops and Roll With 9 Fruit Dextrose confectionery. We also offer a range of sugar free mints. Do you supply sugar free sweets, mints and lollipops? Do you supply Fairtrade confectionery? Yes we can supply Fair Trade confectionery especially when it comes to chocolates which are a firm favourite. Simply ask our team for the product name or search for Fair Trade on our website.